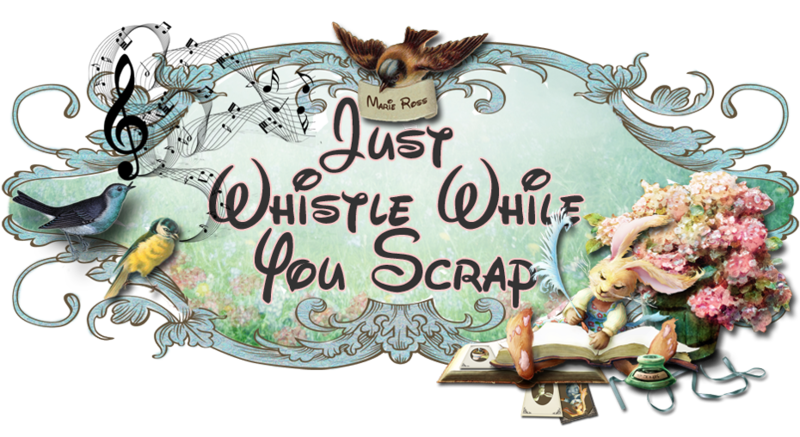 Just Whistle While you Scrap: The Best Just Got Better - A Look at the New Cameo Machine! 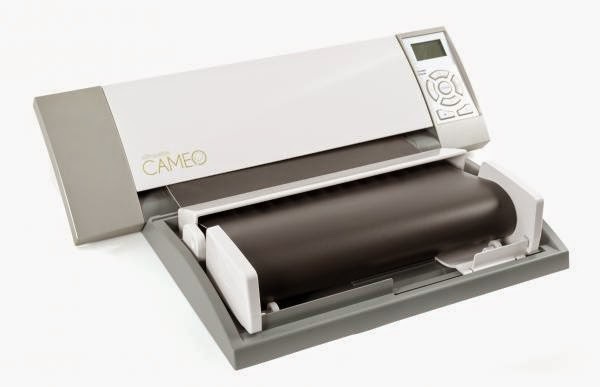 The Best Just Got Better - A Look at the New Cameo Machine! Get your morning coffee and sit right down because this is going to be a long, interesting and good read! I told you October 15th would be a good day and it is! The New Cameo Machine is in the house! 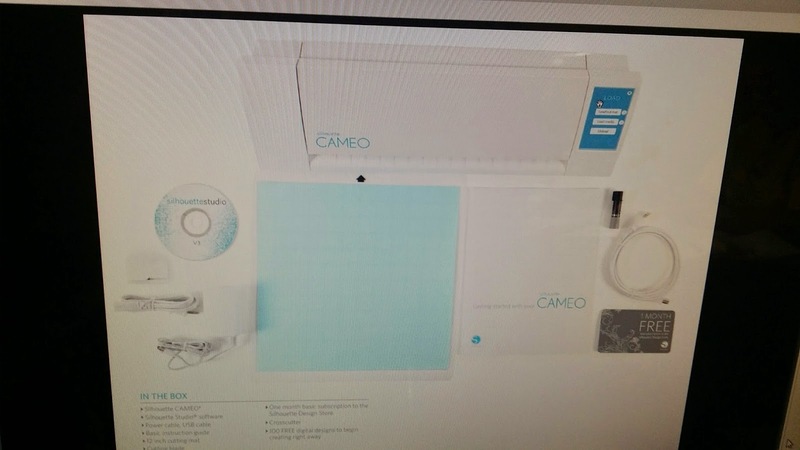 The Silhouette retailers were invited a few weeks ago to a webinar presentation of the New Cameo and new Silhouette products. Conrad Walsh, Director of Marketing at the Silhouette Offices in Orem, Utah was in the house and made the presentation. There were plenty of new products that were introduced. I am happy to divulge all the big news! NEW - Permanent Glossy Vinyl - NOT removable. Great for outdoors, car decals, and mugs! Dishwasher safe. NEW - 2014 Advent Calendar - Back by Popular Demand! Will come with downloadable card with 42 exclusive designs. This is a limited item. If you would like me to custom order one (or some! ), please email your request to me. NEW - Holiday Vinyl Starter Kit - This kit will contain 4 - 9"color vinyl sheets in red, green, silver and gold, 1- 9" transfer paper roll, 1 Metallic Pen Pack, 1 Hook, 1 Scraper and fifteen (15) exclusive holiday images! If this is something you are interested in, please email me your request. I will be having a special price on this set.....but only to those that email your request! Trust me, it will be a fabulous price! 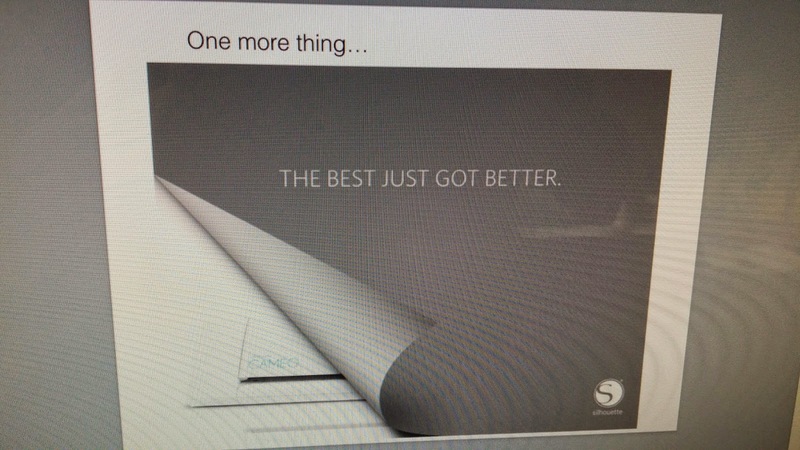 Before I get into telling you about the new machine, there is a new software that is coming out very soon. It is called Silhouette Software Business Edition. 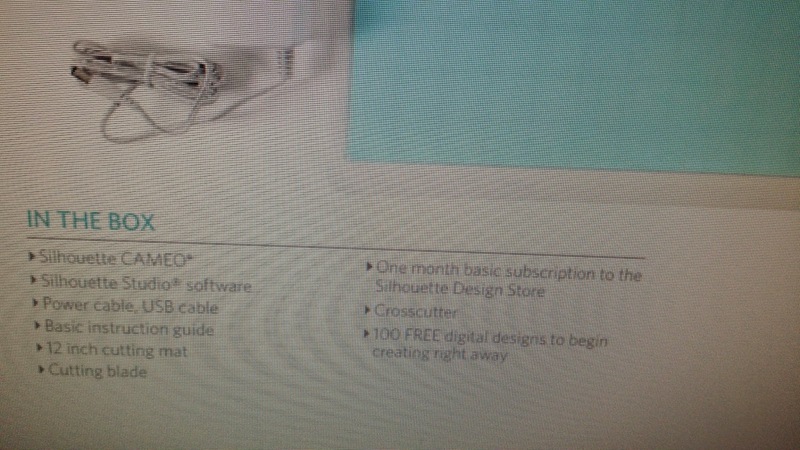 This is an upgrade to the Silhouette Designer Studio Edition and will sell for $99.99. If interested in this new software, please email and I will get you the best price possible. It will be a downloadable code and you should receive it 24-48 hours after placing and confirming the order with me. AI/EPS/CDR file type support - Now you can download files from Adobe Illustrator and Corel Draw right into your Silhouette software! Weed Settings Tool - This feature provides the option to create weed lines within open line paths for easier weeding of materials such as vinyl and heat transfer. Options include a surrounding weed line border as well as internal weed lines inside the design's open spaces (such as within letters) to provide an easy method of removing excess material after the completion of the cut job. Automated Nesting Preview Mode - shapes are automatically nested within the Media Layout View to provide efficient usage of the material being cut, while maintaining the image's original positioning in the Design View thus allowing the user to continue editing and refining the design. Matrix Copy Feature - This feature will provide the ability to create matrix of multiple copies of the same project that are replicated during the processing of the cut job but which do not actually alter or effect your original design. Automated Tiling Feature - The Tiling feature provides a method by which a larger job can be cut from a series of smaller tiles which are then assembled after the cutting process is completed in order to create the larger scale job. By example, the Tiling feature will allow the user to design a large scale image of 24 inches height by 24 inches width and cut it out in several passes. Even though such a material size cannot be cut in a single pass due to the Silhouette's maximum cutting width limitation of 12 inches, the Tiling feature will automatically segment the job into a series of smaller jobs that can be cut out and then assembled to achieve the final 24 inch by 24 inch project. Introducing the New Silhouette Cameo! 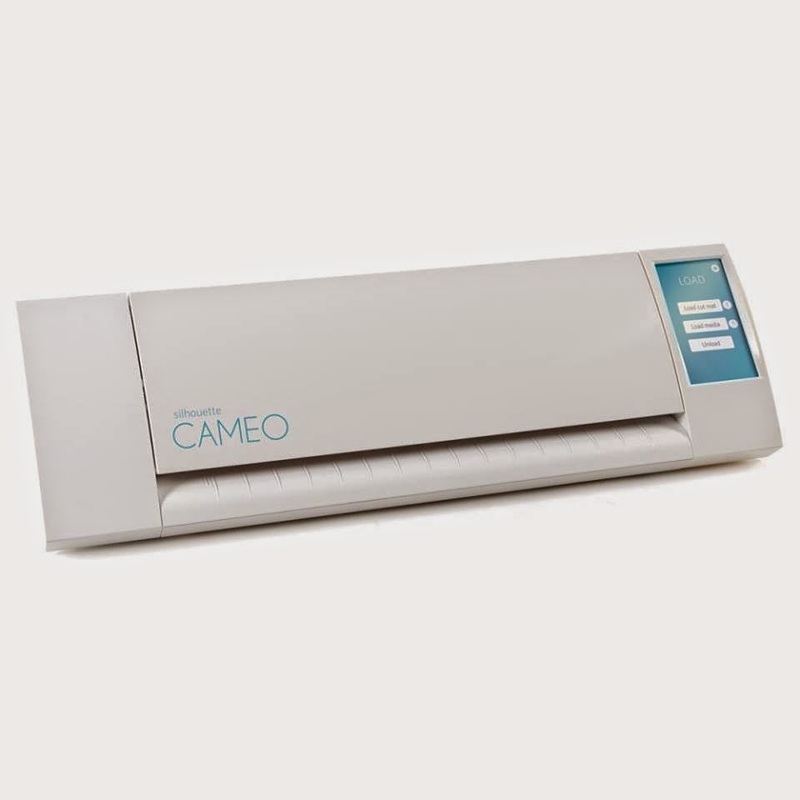 Silhouette Cameo is the #1 cutting machine in the Arts and Crafts industry. I think we knew that! The photos below were taken from my PC from the webinar with my Samsung Note 3 smartphone. They are not the best but you will be able to see the new features. My 'Snag It' program was not working and I do apologize for the fuzziness of these pictures. Is this not beautiful and sleek? A similar look to the old Cameo but this one looks more modern and radiant. Don't you think so too? 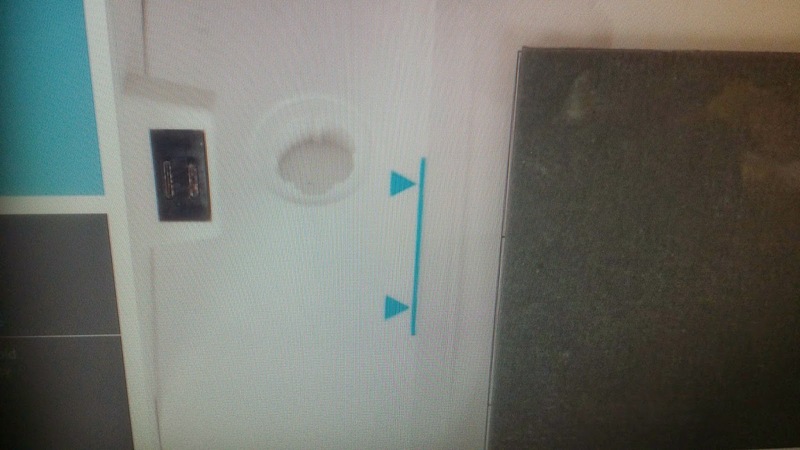 On the right side you will see a full color, high-resolution, LCD touchscreen. Can we say Hoo-Wee! From this screen you can choose a "help" feature which is especially good for newbies to help them work with their machines. You can also customize a "sleep" schedule for your Cameo that you can fit around your schedule. 1. Steel spring rollers: In the former Cameo machine, the rollers are hard plastic. Steel spring rollers were added because they are more gentle to delicate materials. An example would be cutting foam. Steel spring rollers will not leave those nasty impressions. 2. Fiberglass-Reinforced Belt - this is a longer-lasting belt and built more durable. Holds on tighter for a more precise cut. 3. Built-In cross-cutter! There is a channel that is attached to the back of the Cameo. After you complete a cut job, it will give you the option to advance your material. 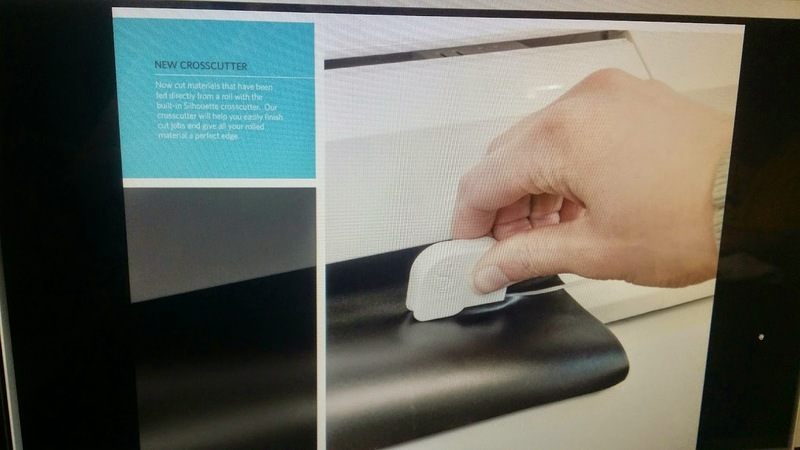 The photo below shows vinyl that has been advanced to the cross-cutter. This is a fabulous addition to those that work with vinyl. Now you can get that straight cut that was almost impossible to do with the former Cameo. You will never have to unload your vinyl out of the machine. It also come with that handy little cutter you see below. 4. Guide Mark - Finally! Now aligning your cutting mat is a snap! No more guessing where your mat should or should not go. I don't know why this wasn't thought of the first time around. 5. USB port for crafting without the use of your PC! 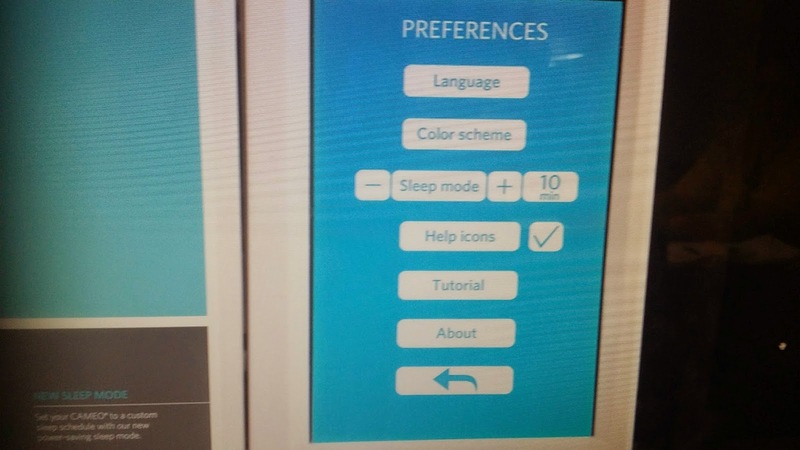 It is located to the right of the off/on button which is the blue button on your right. 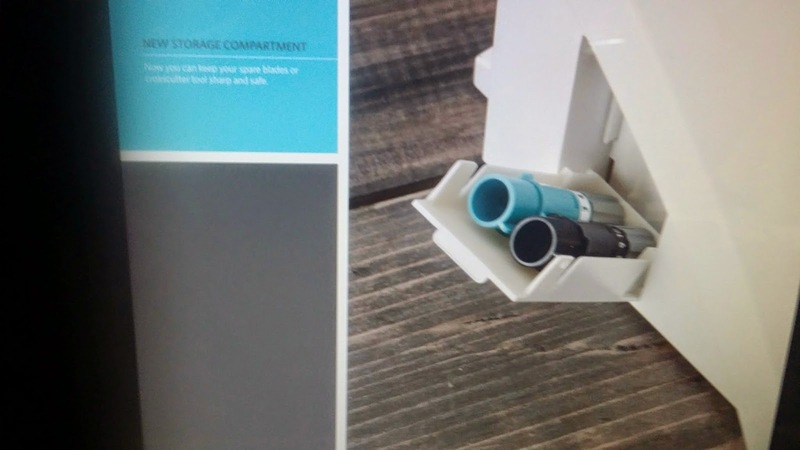 You will be able to cut your designs directly from your USB drive. Craft nights are going to be so much easier because you can download your files to a USB drive and just take your Cameo sans PC with you! 6. Storage compartment. Great for keeping your blades (you can even store the cross-cutter here). At least your blades won't go MIA anymore. 7. 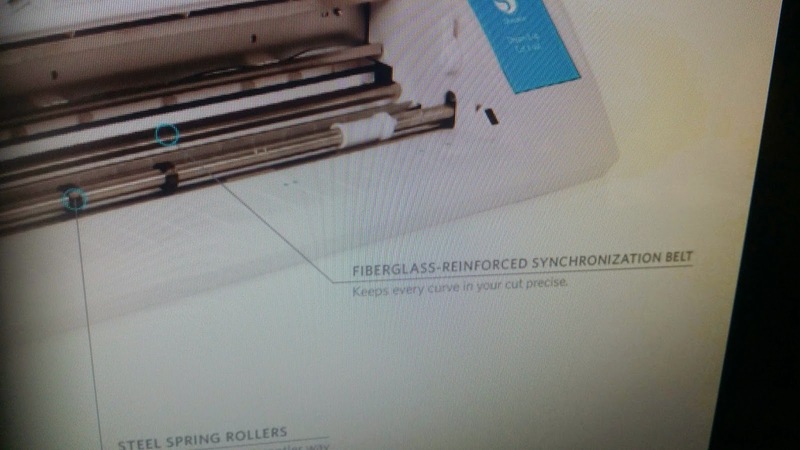 Roll feeder.....this may not be new to some of you, but it is a new feature for cutting vinyl without a mat. The roll feeder lets the vinyl feed through the machine so that bigger DYI projects can be made easier and faster. I have a very limited quantity of the roll feeder in my Etsy store. 8. Newly Re-branded Silhouette Design Store - One of the best collections for digital art and very modestly priced. There are great annual subscriptions you can sign up for too. Silhouette has had a digital design store longer than any other company out there and they know what the consumer wants and is looking for. The other company's designs are not, at least in my opinion, the best. I'm very picky with what I buy, and I won't say I don't buy someone else's digital designs, because I do. 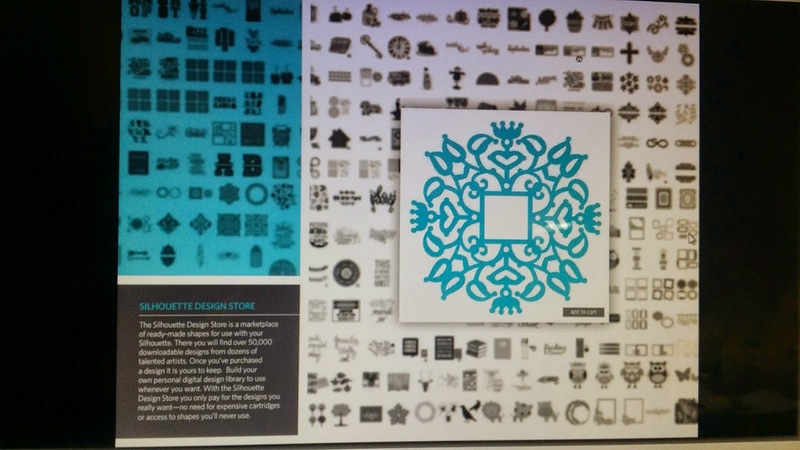 Having said that, I do end up at the Silhouette Design Store and end up buying more digital content. Here is what you get in the box. It will retail for the same amount as the Silhouette Cameo (approx. $299). If you are going to buy a new Cameo (and by the way, the name of the new machine is the Silhouette Cameo. No new name, just a more advanced and sleeker-looking machine. If I were to buy one, I would wait for Black Friday as I heard they are having a promotion for the holidays. OK, so start asking your husbands, boyfriends, significant others, your kids.........whoever you want, that you would like a brand new model Silhouette Cameo for the holidays!!! Print and cut is nothing new as it has been with the Cameo (actually all the way back to the Craft Robo machine which was pre-Cameo). This advanced feature was pioneered by Silhouette a decade ago. There is as with all other Silhouette machines, an optical scanner for your print and cut. Nothing new here, folks as this works like magic. Remember to pick up your Pix Scan mats and you are ready to go! Silhouette is having a hard time keeping these mats in stock. I do have a limited quantity of them in my Etsy shop, so if you would like one, now is the time to get one! Q: Will you be able to save as an SVG? Will it emboss (embossing tool)? What about Wi-Fi? A: All versions of Silhouette Studio currently only save into a STUDIO or STUDIO3 file format. There is no embossing tool currently offered for any Silhouette cutting model. 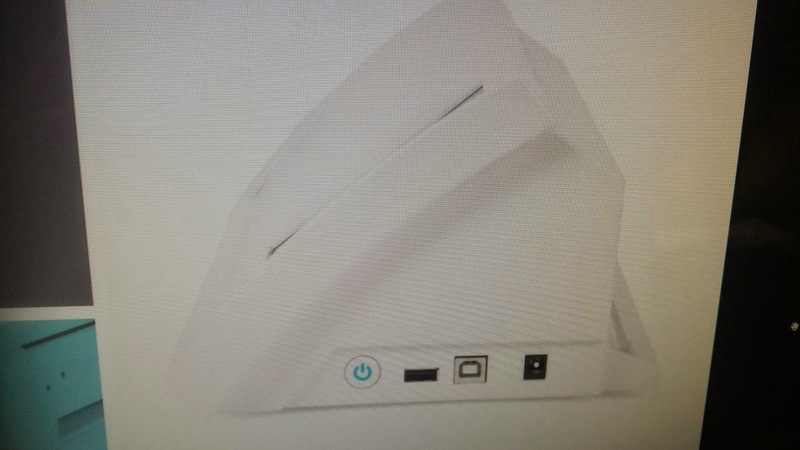 The new CAMEO will not include WiFi. Meaning.........no saving to SVG. If you have the older version/s that saved to SVG.......DO NOT DELETE THEM! I knew the Cameo would not include WiFi at the get go.......but that doesn't mean that they're not working on it because a little bird told me they are. When? Who knows........but I will be asking this same question again at CHA. That's going to be a good show this coming January. This was one of my longest posts ever and if you got to the end...............thank you. I took most of the day yesterday to type this up as I didn't want to you to miss anything that was important. If you have any questions, I will try to answer. If I don't know the answer I will pass them over to my Rep for him to answer. One thing is for sure: I can't wait for CHA this year! WOW!!! Well, thanks, Marie, you have me coveting the new Cameo like crazy!! I am looking at my funds and hoping to get the Pix Scan mats soon. I read the whole post and it was really informative, thanks! Designs by Miriam now on Pinterest. Blog Design By: using images by the talented Lorie Davison. Copyright: Designs by Miriam 2014. Ethereal theme. Powered by Blogger.